Motorola Atrix 4G Gingerbread (2.3.4) update now available on Motorola support site for AT&T users. It’s not an automatic over-the-air (OTA) update but you have to manually download 161 MB update and install it. 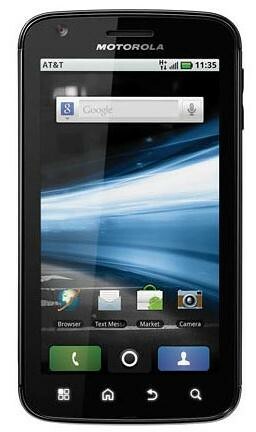 How to Upgrate Motorola Atrix 4G to Gingerbread (2.3.4)? Requirements needed to ensure a successful upgrade. A microSD card installed in your phone with approximately 200 MB of free space. To ensure optimal performance after the upgrade, the phone software must not have been modified in any way. a. Download the file (161 MB) and save to your computer as "Blur_Version.4.5.91.MB860.ATT.en.US". NOTE: Some Internet Browsers (e.g. Safari and Chrome) can be configured to automatically extract downloaded zip files. Please ensure the file is not unzipped after saving it. The upgrade requires use of the zipped file. Make sure your battery is fully charged so that you don't run out of power during the upgrade process. Scroll down and select About Phone. After a couple of minutes, your device will confirm the upgrade is available. The Install upgrade prompt will appear. Select Install Now. Your device will power off and display installation progress. It will then power up and stay on the carrier logo for up to 5 minutes before powering on to the home screen. Please do not interrupt this process. Contacts and email from Google and MOTOBLUR may take up to 60 minutes to synchronize. The phone may appear slower during this initial synchronization process.